On Monday, November 2, 2015, Dr. Ginsburg addressed an audience of families and community members who learned a great deal about raising children to become resilient, and paving the way for a lifetime of healthy coping skills. 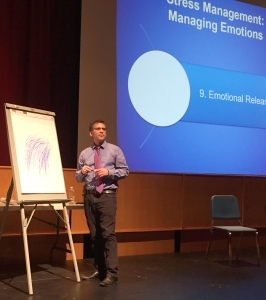 The following day, Dr. Ginsburg spoke to the entire Kindergarten through grade 12 staff of Hatboro-Horsham School District for a full Professional Development Inservice Day. The feedback from both presentations has been tremendous, and now you have the opportunity to see what all the excitement is about! Thanks to Bob Anderson, HHSD’s videographer (with help from Val Fasy), we are able to provide the complete videos from both presentations. Ken Ginsburg, MD, MS Ed is a pediatrician specializing in Adolescent Medicine at The Children’s Hospital of Philadelphia and a Professor of Pediatrics at the University of Pennsylvania School of Medicine. “Dr. Ginsburg was absolutely terrific.